"I tinkered with a few recipes and came up with this one. I have tinkered with this recipe and added celery once and leeks another time, for me all it did was add to the chunkiness, not the flavor; but that's really up to your preference." Stir beef stock, tomato sauce, water, onion, carrot, barley, mushrooms, and garlic together in a slow cooker. Season beef chunks with garlic salt, salt, and black pepper; add to the beef stock mixture. Add bay leaves to the slow cooker. Cook on Low until the soup thickens and the beef is tender, about 6 hours. Remove and discard the bay leaves to serve. If you have time you can brown the beef, but it's just as good without the beef browned because the slow cooker makes the beef very tender. Delicious! I used tomato sauce, exactly like the recipe called for. 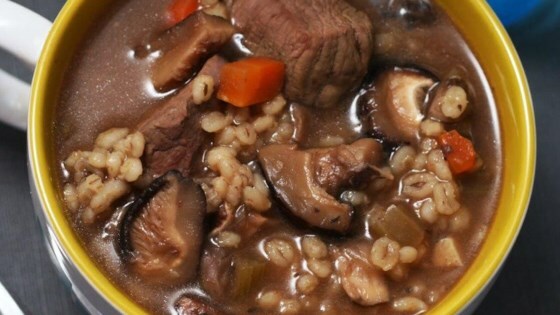 I have made this beef barley soup many,many times and we love it...did cut down barley to 3/4 cup. Thanks for a wonderful recipe that works every time. Made it exactly as listed at least 3 times. It is delicious.